The National Probation Service is a statutory criminal justice service that governs high-risk offenders who are placed from prison back into the community. The Rotherham Clinical Commissioning Group are responsible for making sure the people of Rotherham have the medical care they need. They work closely with the 31 GP practices who are members of the CCG to ensure that health is linked to help for people in need. Rotherham Metropolitan Borough Council sets policies and planning around essential community services. South Yorkshire Community Rehabilitation Company works with low and medium risk offenders, helping them to rehabilitate and integrate back into society. South Yorkshire Fire and Rescue Service serves a community of about 1.29 million people. Their goal is to keep the residents of the area safe. They cover 22 fire stations across South Yorkshire. South Yorkshire Police is the statutory policing team for the South Yorkshire area, covering Barnsley, Rotherham, Doncaster and Sheffield. The South Yorkshire Police and Crime Commissioner acts as the voice of the people of South Yorkshire, telling the Police what the community expects of them. It is the Commissioner who creates and funds the Police and Crime Plan. The mission of the registered charity Voluntary Action Rotherham is to support and develop effective, sustainable and influential voluntary and community action which brings positive change in the lives of individuals and communities in Rotherham. 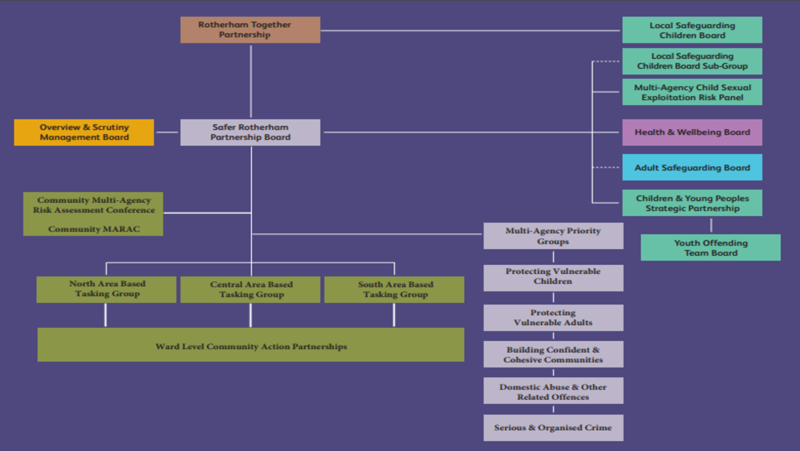 The Safer Rotherham Partnership Board manages the strategic plan for the Community Safety Partnership. It agrees funding and monitors performance to make sure Rotherham is a safer place. The Board is accountable to the Rotherham Together Partnership.